Here we have another Photoshop sketch, this time of M42, the Orion Nebula. This sketch shows closely what I see through my 10" Zhumell Dobsonian from Ashtabula, OH. This image was made using a photograph of M42, and then manipulated to sketch a view as through a modest amateur telescope. 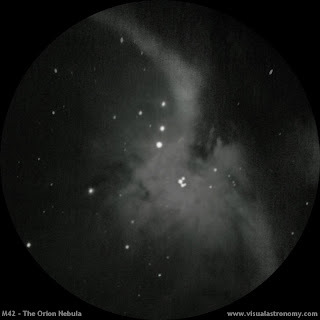 A "photoshop" sketch of M42, the Orion Nebula. just been looking at M42 with my 7 year old and wasn't quite sure if he got it all... your "sketch" was realy helpful to show hime after and confirm he saw what I saw! Great. Thanks! Glad I could help with this sketch! Incredible actually great and also this has been significantly beneficial to entice absolutely free themes efficiently. I do believe on a regular basis I will be observing your website. The particular content is really great. Today just click here Cash Advance Many thanks regarding revealing this kind of and also you should retain up-date similar to this.